The highly efficient Hyundai automatic transaxle has four forward speeds and one reverse speed. The individual speeds are selected automatically, depending on the position of the speed selector lever. The selector lever has 2 gates; the main gate and the manual gate. NOTE: For information on manual gate operation, refer to "Sports Mode". In the main gate, the selector lever has 4 positions, and is equipped with a button to avoid inadvertent selection. NOTE: Depress the brake pedal and push the button when shifting. Push the button when shifting. The selector lever can be shifted freely. The first few shifts on a new vehicle, or if the battery has been disconnected, may be somewhat abrupt. This is a normal condition, and the shifting sequence will adjust after shifts are cycled a few times by the T.C.M (Transaxle Control Module). CAUTION: Never shift into "R" or "P" position while the vehicle is moving. The indicator lights in the instrument cluster indicate the selector lever position when the ignition is switched "ON". During "D" range operation, green lights indicate the gear currently in use. Use to hold the vehicle in place when parked or while starting the engine. Whenever parking the car, apply the parking brake and shift the selector lever to the "P" (Park) position. CAUTION: Never place the selector lever in the "P" (Park) position unless the vehicle is fully stopped. Failure to observe this caution will cause severe damage to the transaxle. Use for backing up the vehicle. Bring the car to a complete stop before shifting the selector lever to "R" position. In the "N" position, the transaxle is in neutral, which means that no gears are engaged. The engine can be started with the shift lever in "N" position, although this is not recommended except if the engine stalls while the car is moving. Use for normal driving. Bring the car to a complete stop before shifting the selector to "D" position. The transaxle will automatically shift through a four gear sequence. Whether the vehicle is stationary or in motion, sports mode is selected by pushing the selector lever from the "D" position into the manual gate. To return to "D" range operation, push the selector lever back into the main gate. In sports mode, moving the selector lever backwards and forwards can make gearshifts simple. UP (+) : Push the lever forward once to shift up one gear. DOWN (-) : Pull the lever backwards once to shift down one gear. SKIP : By rapidly moving the selector forwards or backwards twice, it is possible to skip one gear, i.e. 1st to 3rd or 3rd to 1st. CAUTION: o In sports mode, The driver must execute shifts in accordance with prevailing road conditions, taking care to keep the engine speed below the red zone. For engine protection, upward shifts are made automatically when the engine rpm reaches the red zone. o By rapidly moving the selector lever backwards (-) twice, it is possible to skip one gear, i.e., 3rd to 1st, 4th to 2nd. Since sudden engine braking and/or rapid acceleration can cause a loss of traction, however, downshifts must be made carefully in accordance with the vehicle's speed. NOTE: o In sports mode, only the four forward gears can be selected. To select reverse or park, move the selector lever to the "R" or "P" position as required. o In sports mode, downward shifts are made automatically when the vehicle slows down. When the vehicle stops, 1st gear is automatically selected. o To maintain the required levels of vehicle performance and safety, the system may not execute certain gearshifts when the selector lever is operated. o Before driving away from a stop on a slippery road, push the selector lever forward into the +(UP) position. This causes the transaxle to shift into 2nd gear which is better for smooth driving away on a slippery road. Push the selector lever to the -(DOWN) side to shift back to 1st gear. NOTE: o For smooth and safe operation, depress the brake pedal when shifting from "Neutral" position or "Park" position to a forward or reverse gear. o The ignition key must be in the "ON" position and the brake pedal fully depressed in order to move the shift lever from the "P" (Park) position to any of the other positions. o It is always possible to shift from "R", "N", "D" position to "P" position. The vehicle must be fully stopped to avoid transaxle damage. CAUTION: o Shift into "R", "D" and "P" position only when the vehicle has completely stopped. o Do not accelerate the engine in reverse or any of the forward positions with the brakes applied. o Always apply the footbrake when shifting from "P" or "N", to "R" or "D"position. o Do not use the "P" (Park) position in place of the parking brake. Always set the parking brake, shift the transaxle into "P" (Park) position and turn off the ignition when you leave the vehicle, even momentarily. Never leave the vehicle unattended while the engine is running. o When accelerating from a stop on a steep hill, the vehicle may have a tendency to roll backwards. 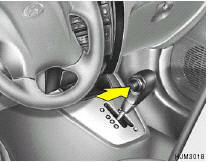 Shifting the shift lever into 2nd gear while in Sport mode will help prevent the vehicle from rolling backwards. o Check the automatic transaxle fluid level regularly, and add fluid as necessary. o See the maintenance schedule for the proper fluid recommendation. 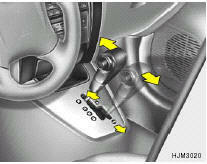 o Never move the gear selector lever from "P" or "N" to any other position with the accelerator pedal depressed. o Never move the gear selector lever into "P" when the vehicle is in motion. o Be sure the car is completely stopped before you attempt to shift into "R" or "D". o Never take the car out of gear and coast down a hill. This may be extremely hazardous. Always leave the car in gear when moving. o Do not "ride" the brakes. This can cause them to overheat and malfunction. Instead, when you are driving down a long hill, slow down and shift to a lower gear. When you do this, engine braking will help slow the car. o Slow down before shifting to a lower gear. Otherwise, the lower gear may not be engaged. o Always use the parking brake. Do not depend on placing the transaxle in "P" to keep the car from moving. o Exercise extreme caution when driving on a slippery surface. Be especially careful when braking, accelerating or shifting gears. On a slippery surface, an abrupt change in vehicle speed can cause the drive wheels to lose traction and the vehicle to go out of control. o Optimum vehicle performance and economy is obtained by smoothly depressing and releasing the accelerator pedal. CAUTION: If your vehicle becomes stuck in snow, mud, sand, etc., then you may attempt to rock the vehicle free by moving it forward and backward. Do not attempt this procedure if people or objects are anywhere near the vehicle. During the rocking operation the vehicle may suddenly move forward of backward as it becomes unstuck, causing injury to nearby people or damage to objects.